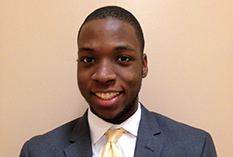 Kameron Sheppard’s interest in computer engineering began when he was 16 with the programming language Python. Now a rising junior in the University of Maryland Department of Electrical and Computer Engineering, Sheppard is using his skills at the UAS Test Site to enhance search and rescue procedures under the guidance of Dean Darryll Pines. What first sparked your interest in UAS technology? My initial interest in UAS actually came while watching some of the many YouTube videos featuring aerial photography. I find some of the images to be very captivating. What is the goal of your internship project? The goal of my project is to create a virtual reality control room control where a human operator can oversee the activities of a search and rescue drone swarm. A normal swarm operator would have to look through the video produced manually by a swarm, and there might even be so much video that it's actually impossible to view what the swarm is capturing in real time. My application would allow a person to manually oversee a swarm that consists of hundreds of drones instead of just the 10 possible now and prevent them from missing the search target, however briefly it appears on the screen. Where are you in your project? I've completed communications for the swarm, enabling video to be sent from drones in the air to the operator on the ground. I'm currently working on designing and creating a virtual environment that would give the operator the most functionality. What have you enjoyed most about working at the UAS Test Site? Something I enjoy a lot about the UAS Test Site is “fly days.” The team generally goes out every Thursday to fly. If I'm ever stalled on a particular problem, I can come along to get some perspective on the problem. What has been the most challenging element of your internship so far? Dealing with radio transmissions, frequencies, antennas, and the other communications tools. Before this internship, I had zero experience with radios and what it takes to get them working correctly. What do you know about UAS technology, testing, or project planning now that you didn't before your internship? One thing I now know is that professional UAVs are all about safety. For example, I've learned that you actually need special permission to fly a drone over people to ensure that a potential crash would not harm anyone. What advice do you have for students considering an internship at the UAS Test Site next summer? Advice I would give to potential applicants is think bigger when you propose a project. I originally thought I wasn't going to be able to do my project because I needed a lot of computer equipment to get it up and running. However, the test site was extremely helpful, and I was able to acquire everything I needed.